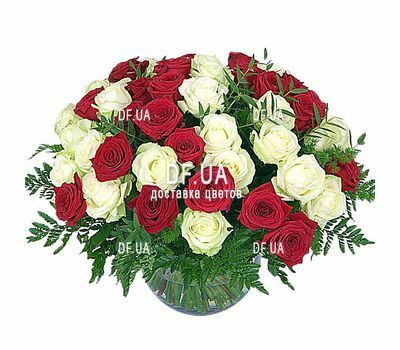 Bouquet with red and white roses in any package looks beautiful. Fluffy strips of green grass add a special chic to the bouquet. This is a great option for a gift for a birthday, anniversary or wedding. 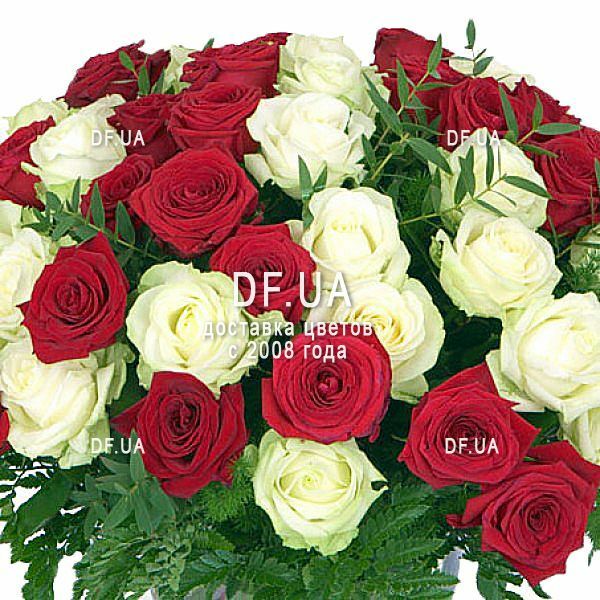 So a bouquet of red roses and whites can be congratulated colleague with a raise or the head of the successful completion of the transaction. 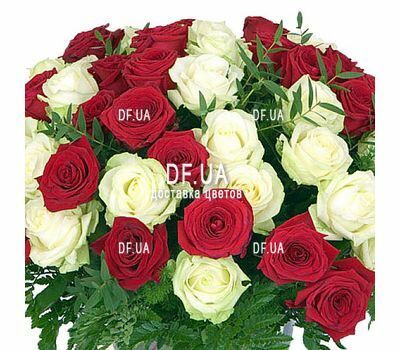 Roses will stand for a long time and delight with their variegation and exquisite beauty. 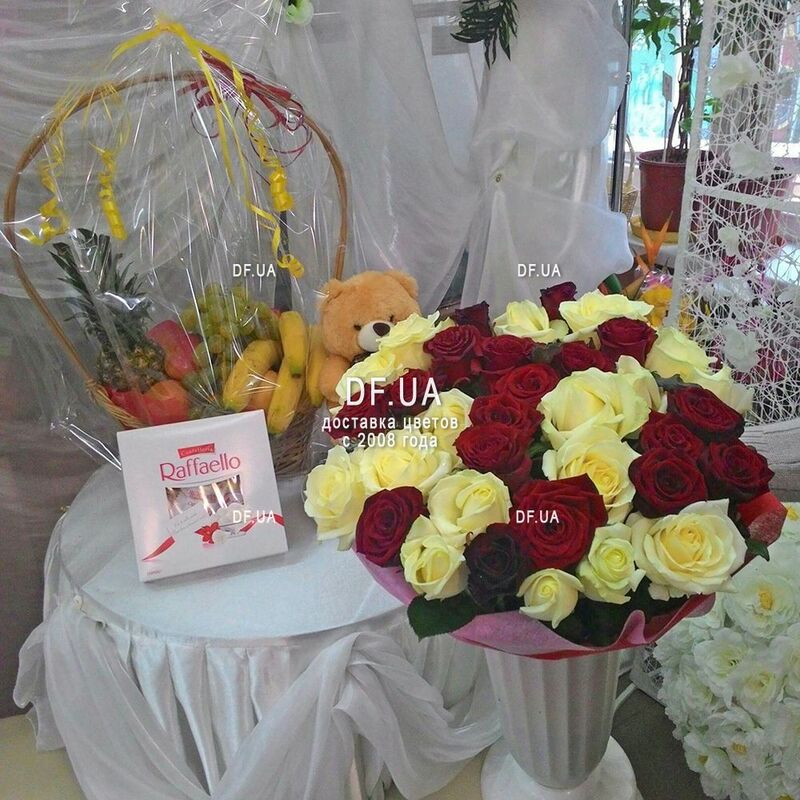 The bouquet is made in a special way that it is equally good for both women and men. Therefore, as a bouquet to work, it has another important and fat plus. Такой радости и восторга от близких я давно не слышала!! Спасибо за то, что вы делаете, спасибо за вашу чуткость и ответственность, спасибо, что сделали праздник, большое-большое спасибо!!!! Добрый день, хочу сказать спасибо всем сотрудникам этого магазина. Так получилось, что, когда ребята приехали, именинница как раз я магазин вышла. Но спасибо курьеру, который все таки дождался ее и вручил букет лично в руки! We can not give you any guarantees about how many flowers will remain fresh after delivery. Since this is affected by a lot of factors that we can no longer influence, after the delivery of the bouquet. It depends on which of the flowers you chose the bouquet, how they will care for the bouquet and in what conditions it will be after delivery. It depends on that the bouquet will be put in how high the vase and how much water will be in the vase, at what temperature it will be, where it will stand, how often the water in the vase will change, how often the flower stems will be cut, etc. 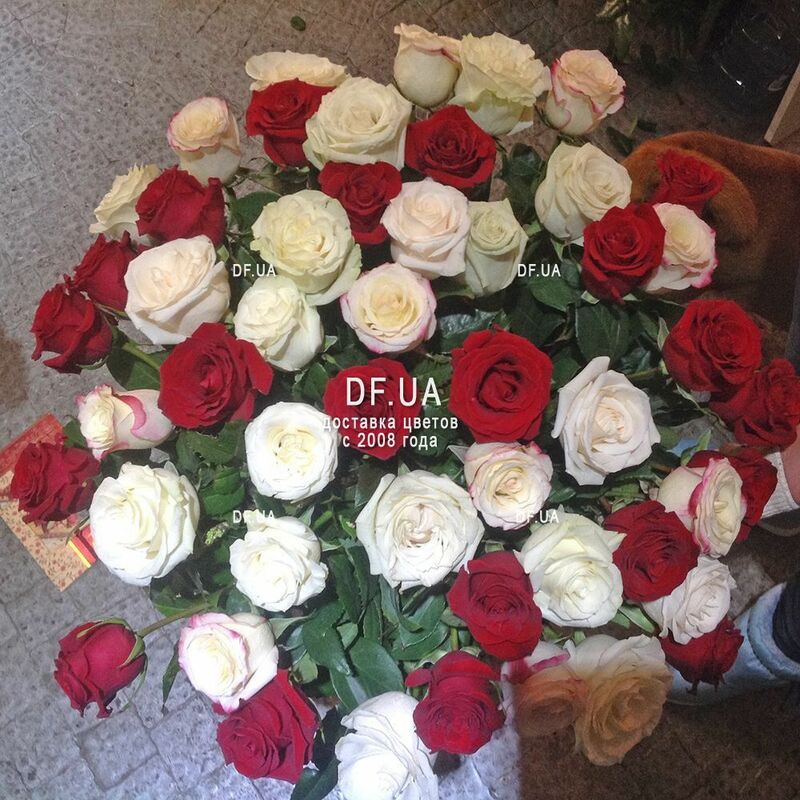 We give you a 100% guarantee that we will deliver a bouquet of fresh flowers. It directly depends on us, but we can not give a guarantee on what does not depend on us. If you want the bouquet to stand longer, choose bouquets of their chrysanthemums or alstroemerias - these are persistent flowers, and the most not persistent flowers are roses. Consider this when choosing a bouquet. 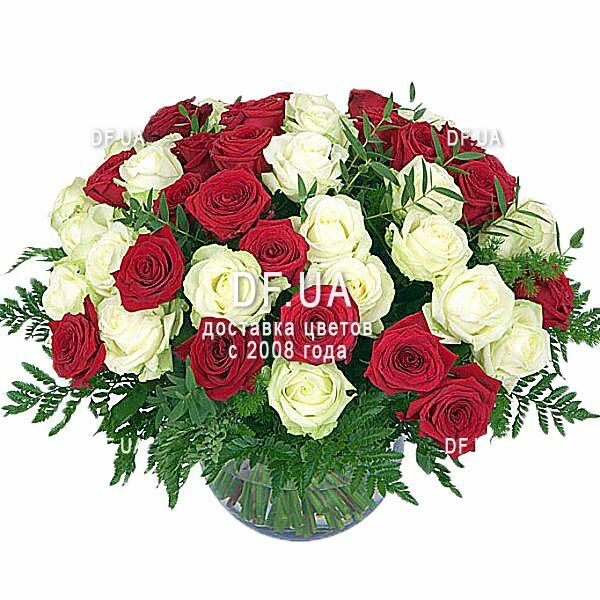 Delivery to big cities of Ukraine is free (provided that there are flowers in the order). Delivery the order which does not include flowers (only sweets, cake, balls, soft toys, vases, etc.) - 150 UAH. 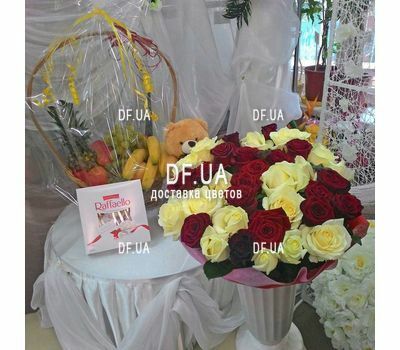 We can deliver a bouquet to any city or village of Ukraine. If the village where you want to deliver the order is not in the list of cities - contact us and we will inform you the cost of delivery to the desired village. On this page you can find all the payment methods that you can pay for your order. You will be able to pay for the order after it is placed. For you to see the payment methods available to you personally - choose in which country you are located.